The early history of the Roman Catholic Church in Grayshott centres very largely round Mr. and Mrs. Vertue and Canon Louis Harvey. Mr. and Mrs. Vertue came to Grayshott in the early 1890s and lived at "The Court," the original I'Anson house. Here there was a private chapel in which services for the local Roman Catholics were held-the first Mass being celebrated in 1891. Mr. Vertue died in 1904 and was survived for many years by his widow, who continued in devoted work for the Roman Catholic community. 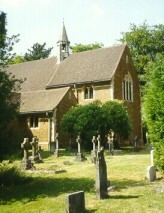 In 1910 she built St. Joseph's Church and Presbytery, which were opened and consecrated in 1911 by Bishop Cotter of Portsmouth. St. Joseph's is a beautiful and very light church. When we think of the Roman Catholic Church in Grayshott we think of the Convent of the Cenacle [now closed] as well as of St. Joseph's. The Convent played its part in both World Wars. From 1914 to 1918 one wing of it was used as a military hospital with 25 beds. The nuns helped with the cooking and work in the wards. In all it treated 835 cases. 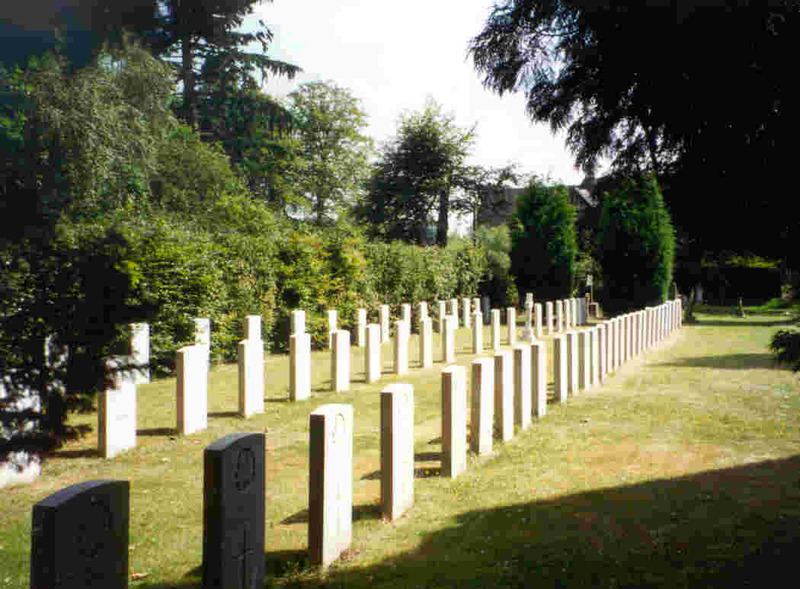 Note: The graves of 317 other Canadians who died in Bramshott during World War 1 will be found in St. Mary's churchyard, Bramshott  two miles to the south. The letter and number after each name show the Row and the number of the grave in the row. The list is taken from information supplied by the Commonwealth War Graves Commission. Special note on the plot numbering system - three rows of stones run north-south: A (rear), B (middle), C (front); plot numbering starts near the middle of each row, eg numbers A1, A2, etc run south from this point, and A01, A02, etc run north. Note: There is a gap between plots C014 and C015 which appears never to have been used. KELLY, Private, NAZAIRE. 889590. 22nd (Reserve) Bn. Canadian Infantry (Quebec Regt.). 18th October 1918. Age 21. Son of Virginie Ouellet Kelly, of St. Louis de Courville, Quebec. A. 05. McCLUSKEY, Private, J. 3259785. 13th (Reserve) Bn. Canadian Infantry (New Brunswick Regt.). 17th October 1918. A. 04. HAMELIN, Private, MICHEL, 3353433. 15th (Reserve) Bn. Canadian Infantry (Saskatchewan Regt.). 4th October 1918. Son of Francois Xavier Hamelin and C. Landry, his wife. Native of Buckingham, Quebec. A. 03. KNAUS, Private, WILLIAM EDWARD. 3352093. 15th (Reserve) Bn. Canadian Infantry (Saskatchewan Regt.). Died or influenza 5th October 1918. Age 21. Son of William and Alice Knaus, of Manresa, Saskatchewan. A. 02. BARRY, Private, JOHN J., 494238. 15th (Reserve) Bn. Canadian Infantry (Saskatchewan Regt.). 2nd October 1918. Age 22. Son of Thomas and Bridget Barry. Native of Frampton. P.Q., Canada. A. 01. KANE, Private, P. J, 440533. 53rd Bn. Canadian Infantry. 9th May 1916. Son of Anastasia Kane, of Rivanagh, Coolcullen, Bagenalstown, Co. Carlow. Ireland. A. 1. MURPHY, Private, JOHN, 1081062. 127th Bn. Canadian Infantry. 30th October 1916. A. 2. DIONNE, Private, G, 643868. 157th Bn. Canadian Infantry. 18th November 1916. A. 3. McDONALD, Private, J E, 148029. 78th Bn. Canadian Infantry (Manitoba Regt.). 24th November 1916. A. 4. CHARRON, Private, O, 847788, 150th Bn. Canadian Infantry. 1st December 1916. A. 5. FITZGERALD, Private, JOHN JAMES, 724248, 109th Bn. Canadian Infantry. Died of accidental injuries 14th December 1916. Age 43. Son of John and Margaret Fitzgerald (née Burns). A. 6. MAROTT, Private, J, 243491. 163rd Bn. Canadian Infantry. 29th December 1916. A. 7. McLEOD, Lieutenant Colonel, RODERICK CAMPBELL, 9th Stat. Hosp. Canadian Army Medical Corps. 4th January 1917. Husband of Annie McLeod, of 194, Jubilee Rd, Halifax, Nova Scotia. A. 8. McKINNON, Private, J. 878228. 193rd Bn. Canadian Infantry. Died of tubercular meningitis 11th January 1917. Age 19. Son of Mr. and Mrs. Archie McKinnon, of Sydney Mines, Cape Breton, Nova Scotia. A. 9. DUNNICLIFFE, Sergeant, R, 154368. 25th (Reserve) Bn. Canadian Infantry. 30th January 1917. A. 10. GASLER, Private, HAROLD CHARLES PHILIP, 469855. 26th (Reserve) Bn. Canadian Infantry, Died of accidental injuries 16th August 1917, Age 26. Son of Sophia A. Gasler, of 21, Allen St., Halifax, Nova Scotia, and the late Henry Peter Gasler. A. 12. BOYER, Private, HORMIDAS, 1051625. 15th Reserve Bn. Canadian Infantry (Saskatchewan Regt.). 9th September 1917. Age 23. Son of J.C. Boyer and Angele Ouelette, his wife, of Springbourne, Saskatchewan. A. 13. TAILLON, Private, C E. 660439. 10th (Reserve) Bn. Canadian Infantry (Quebec Regt.). Died of pneumonia 20th October 1917. Age 27. Husband of Antoinette B. Taillon, of 506, Napoleon St. East, Montreal. Native of St. Esprit, Montcalm Co., Province of Quebec. A. 14. PROULX, Sergeant, JOSEPH PHILIAS. 1021066. 23rd [223rd on stone] (Reserve) Bn. Canadian Infantry (Quebec Regt.). 2nd January 1918.Husband of Anna Proulx, of 41, Dumoulin St., St. Boniface, Manitoba. A. 15. HOARE, Private, PATRICK JOSEPH, 414995. Canadian Army Medical Corps. Died of bronchial pneumonia 7th February 1919. Age 26. Son of Edward and Mary Hoare, of Blowers St., Halifax, Nova Scotia. A. 16. JACKSON, Private, R. 46494. Canadian Army Service Corps. Died of influenza and pneumonia 16th February 1919. Age 24. Son of Richard and Isabel Jackson; husband of Margaret Jackson, of 113A, Debiencourt, Villa-Emard, Montreal. Born at Patricroft, Manchester, England. A. 17. HIGGINS, Private, JOSEPH PATRICK, 3032230. 2nd Canadian Mounted Rifles (British Columbia Regt. ), 23rd February 1919. Age 34. Son of James and Margaret Higgins, of 61, Northcote Avenue. Toronto, Ontario. A. 18. LEARY, Driver, P, 43894. Canadian Field Artillery. 24th March 1919. A. 19. LE BLANC, Private, F, 3255853. 13th (Reserve) Bn. Canadian Infantry (New Brunswick Regt.). 20th October 1918. Age 21. Son of Livain and Isabelle Le Blanc. Native of St. Anselme, New Brunswick. B. 010. BARRACLOUGH, Private, PARKER [B.P. on stone], 3106060. Depot Bn. Canadian Infantry (Central Ontario Regt.). 22nd October 1918. Age 40. Son of James and Susan Barraclough; husband of M.E. Barraclough. of 254, Harrison St., Jamestown, New York, U.S.A. Native of Bradford, Yorks., England. B. 011. DOUCET, Private, P. 4061926. 13th (Reserve) Bn. Canadian Infantry (New Brunswick Regt.). 23rd October 1918, B. 012. GRENIER, Private, AMEDEE, 3384383. 10th (Reserve) Bn. Canadian Infantry (Quebec Regt.). Died of influenza 23rd October 1918. Age 25. Son of Jules and Suzanne Grenier, of Ste Adelaide dc Pabos, P.Q., Canada. B. 013. ROWE, Private, J, 3203476. 21st (Reserve) Bn. Canadian Infantry (Alberta Regt.). 21st October 1918. B. 08. FISHER, Private, G, 267720. 214th Bn. Canadian Infantry. 21st. October 1918. B. 09. BEDARD, Private, A. 3162053. 16th (Reserve) Bn. Canadian Infantry (British Columbia Regt.). 17th October 1918. B. 07. COTEY, Private, W J, 2245960. Base Depot. Canadian Forestry Corps. 13th October 1918. Age 22. Born at Boston, Mass., U.S.A. B. 06. HARE, Gunner, A. J., 3233379. Reserve Depot. Canadian Field Artillery. 10th October 1918. Age 23. Son of William and Mary Hare, of 145, De Grassi St., Toronto, Ontario. B. 05. DUPONT, Private, J, 424756. Depot. 1st Canadian Mounted Rifles (Saskatchewan Regt.). 4th October 1918. B. 04. OSBORNE, Private, J W, 1030479. 13th Bn. Canadian Infantry (Quebec Regt.). 23rd September 1918. B. 03. JOYCE, Private, JOHN THOMAS, 1031153. 20th (Reserve) Bn. Canadian Infantry (Quebec Regt. ), 25th September 1918. Age 40. Son of the late Michae1 and Mary Joyce. Native of Yorkshire, England. B. 02. CADIEUX, Private, JOSEPH ARTHUR, 3159336. 10th (Reserve) Bn. Canadian Infantry (Quebec Regt.). Died of pleurisy 14th August 1918. Age 22. Son of Honore Cadieux and Louise Lalonde, his wife, of 104, St. Mary, St. Henri de Montreal, P.Q. Canada. Born at Montreal. B. 01. PAPE, Private, PERCIVAL JOHN, 3110954. 8th (Reserve) Bn. Canadian Infantry (Central Ontario Regt.). 12th September 1918. Age 27. Son of Joseph and Frances Pape. Native of Toronto. B. 1. COADY, Private, PATRICK AUGUSTINE. 3204064. 17th (Reserve) Bn. Canadian Infantry (Nova Scotia Regt.). 28th August 1918. Age 24. Son of Michael and Elizabeth Coady, of North Wiltshire. Prince Edward Island, Canada. B. 2. ROY, Private, E A. 3083917. 20th (Reserve) Bn. Canadian Infantry (Quebec Regt.). 14th August 1918. B. 3. BLAIR, Private, WILLIAM PARKER, 2356068. 4th (Reserve) Bn. Canadian Infantry (Western Ontario Regt.). 5th August 1918. Age 22. Son of William Parker Blair and Elizabeth Blair, of 402, E. Michigan Avenue, Ypsilanti, Michigan. U.S.A. B. 4. CARSON, Private, THOMAS KING. 3106108. 8th (Reserve) Bn. Canadian Infantry (Central Ontario Regt.). 25th July 1918. Age 22. B. 5. ASSELIN, Private, ALBERT. 847658. 22nd (Reserve) Bn. Canadian Infantry (Quebec Regt,). 22nd July 1918. Age 37. Son of Thaddee Asselin and Elizabeth Robert, his wife. Native of St. Felix de Valois, P.Q., Canada. B. 6. GUAY, Private, ALBERT, 636086. Depot. 4th Canadian Mounted Rifles (Central Ontario Regt.). 23rd June 1918. B. 7. NOEL, Private, FRANK. 3107960. 10th (Reserve) Bn. Canadian Infantry (Quebec Regt.). 18th June 1918. Age 21. Son of Mrs Felix Roy (formerly Noel), of Bellevue, Sault Ste Marie, Ontario. Born in Canada. B. 8. STE. MARIE, Private, SIMEON. 243615. 206th Bn. Canadian Infantry. 15th June 1918. Age 42. Son of Amablc Ste. Marie and Sophie Chaput, his wife: husband of Mary Elizabeth Birmingham Ste. Marie, of Hochelaga, Montreal. B. 9. BERRYMAN, Private, LAWRENCE [LAMBERT on stone], 3181449. 17th (Reserve) Bn. Canadian Infantry Nova Scotia Regt.). 9th June 1918. Age 22. Son of Charles and Mary Berryman, of Point Tupper, Richmond County, Nova Scotia. B. 10. SCHILL, Private, LAMBERT, 4090081. 1st Depot Bn. Canadian Infantry (Saskatchewan Regt.). 28th April 1918. B. 11. HUNSBERGER, Private, F. 2499645. Canadian Railway Troops. 10th April 1918. Age 18. Son of Andrew Hunsberger, of Weyerhauser, Wisconsin, U.S.A. B. 12. WALKER, Company Sergeant Major, C [CHARLES on stone], 63945. 23rd (Reserve) Bn. Canadian Infantry (Quebec Regt.). 7th Apri11918. Son of Helen Walker, of Nether Auchcock, Brucklay, Maud, Aberdeenshirc, Scotland. [Cross instead of regular stone] B. 13. McINNIS, Gunner, J J. 2643870. Reserve Depot, Canadian Garrison Artillery. 3rd April 1918. B. 14. WILCE, Private, G T. 2393432. 12th (Reserve) Bn. Canadian Infantry (Central Ontario Regt.). 24th March 1918. B. 15. CLARKE, Private, FRANCIS HENRY, 3035940. 12th (Reserve) Bn. Canadian Infantry (Central Ontario Regt.). Died of pneumonia 12th February 1919. Age 27. Son of Patrick and Maria Clarke, of Utterson, Ontario. B. 16. RYAN, Private, GEORGE EATHEN. 3030727. 8th (Reserve) Bn. Canadian Infantry (Central Ontario Regt.). 16th February 1919. Age 27. Son of Thomas Peter and Bridget Lena Ryan, of North Dana, Mass., U.S.A. B. 17. HIBALIUK, Sapper, O. 685035. 4th Bn. Canadian Engineers. 10th February 1919. B. 18. GAGNON, Private, C J, M M, 439535. 52nd Bn. Canadian Infantry (Manitoba Regt.). 9th March 1919, Age 27. Son of Joseph and Victoria Gagnon, of Keewatin, Ontario, B. 19. HALL, Sapper, A. O. 3088848. Canadian Engineers. 12th June 1919. B. 20. GASIK, Private, P. 334393. 4th Bn. Canadian Engineers. 1st February 1919. C. 020. DELAIRE, Private, A, 3321505. 6th (Reserve) Bn. Canadian Infantry (Eastern Ontario Regt.). 1st February 1919. C. 019. PENNYLEGION, Private, WILLIAM EDWARD, 862085. 7th Bn. Canadian Infantry (British Columbia Regt.). Died of influenza 31st January 1919. Age 34. Son of Albert and Catharine Pennylegion, of 80, Close Avenue, Toronto. C. 018. McPHERSON, Private, JOHN, 877230. 25th Bn. Canadian Infantry (Nova Scotia Regt.). Died of bronchial pneumonia 25th January 1919. Age 24. Son of Angus and Annie McPherson, of Bridgeport Mines, Nova Scotia. C. 017. CARTER, Private, J. 3183380. 17th (Reserve) Bn. Canadian Infantry (Nova Scotia Regt.). 17th January 1919. C. 016. GARNEAU, Private, C, 320868. 23rd (Reserve) Bn. Canadian Infantry (Quebec Regt.). 11th January 1919. C. 015. AZZALINI, Private, ARISTIDE, 904706. 49th Bn. Canadian Infantry (Alberta Regt.). 1st February 1919. Age 32. Son of Agostino and Maria Azzalini (née Furlan), of Osigo di Fregona. Italy. C. 014. NORELIUS, Private, C, 123109. 58th Bn. Canadian Infantry (Central Ontario Regt.). 11th December 1918. C. 013. LABRECQUE, Private, JOSEPH EDOUARD, 3280323. 10th (Reserve) Bn. Canadian Infantry (Quebec Regt.). 2nd December 1918. Age 21. Husband of Yvonne D. Labrecque, of 130, 5 Rue, Lainoilow, Quebec. C. 012. FLANAGAN, Private, G.E. 3232767. 8th (Reserve) Bn. Canadian Infantry (Central Ontario Regt.). 30th November 1918. C. 011. COURSOL, Private, F, 3172631. 10th (Reserve) Bn. Canadian Infantry (Quebec Regt.). 28th November 1918. C. 010. LINTEAU, Private, A. 3170680. 10th (Reserve) Bn. Canadian Infantry (Quebec Regt.). 17th November 1918, Age 25. [stone missing for repair, July 2003] C. 09. FOURNIER, Private, THOMAS, 3170620.10th (Reserve) Bn. Canadian Infantry (Quebec Regt.). 18th November 1918. Age 28. C. 08. WITHEROW, Private, W, 478022. Depot. Royal Canadian Regiment formerly Duke of Cornwall’s Light Infantry. Died of bronchitis 13th November 1918. Age 40. Son of Stephen and Kate Witherow, of 13, Havelock Rd., Wimbledon, London, England. Served in the South African Campaign. C. 07. LA FRANCE, Private, J, 3169014. 10th (Reserve) Bn. Canadian Infantry (Quebec Regt.). 12th November 1918. C. 06. BARR, Private, F., 4030381. 23rd (Reserve) Bn. Canadian Infantry (Quebec Regt.). 13th November 1918. C. 05. VIGNEUX, Private, A, 3168994, 10th (Reserve) Bn. Canadian Infantry (Quebec Regt. ), 3rd November 1918, Son of Henri Vigneux, of Roxton Falls, Quebec. C. 04. FERLAND, Private, A, 3171346. 10th (Reserve) Bn. Canadian Infantry (Quebec Regt.). 7th November 1918 C. 03. MOON, Private, DANIEL CHARLES, 3208278. 21st (Reserve) Bn. Canadian Infantry (Alberta Regt.). Died of influenza 7th November 1918. Age 23. Son of James R. and Elizabeth Moon, of Didsbury, Alberta. Native of Cazenovia, Wisconsin, U.S.A. C. 02. BUGEIA, Private, F. 3212948. 21st (Reserve) Bn. Canadian Infantry (Alberta Regt.). 5th November 1918. C. 01. LENNER, Private, GEORGE PETER. 3210535. 21st (Reserve) Bn. Canadian Infantry (Alberta Regt.). 5th November 1918. Age 22. Son of John and Mary Lenner, of Spring Lake, Alberta, C. 1. BERNARD, Private, GEORGE ODILON. 3210577. 21st (Reserve) Bn, Canadian Infantry (Alberta Regt.). 4th November 1918. Age 32. Son of Alexandre and Hermina Lamoureux, his wife, of 138, Front St., Woonsocket, Rhode Island, U.S.A. Born at St. Antoine, River Richelieu, P.Q., Canada. C. 2. MORIN, Private, A, 3170550. 10th (Reserve) Bn. Canadian Infantry (Quebec Regt.). 5th November 1918. C. 3. MURPHY, Gunner, THOMAS ROSS. 3085204. Reserve Depot. Canadian Field Artillery. 29th October 1918, Age 25, Son of William Murphy, of 15, Royal Avenue, Notre Dame de Grace, Montreal. C. 4. JOHNSTON, Private, F. L. 3180118. 17th (Reserve) Bn. Canadian Infantry (Nova Scotia Regt.). 31st October 1918. Age 21. Son of Thomas II and Georgina Johnston, of Lower East Pubnico, Yarmouth County, Nova Scotia. C. 5. CARTY, Private, D, 3108801. 8th (Reserve) Bn. Canadian Infantry (Central Ontario Regt.). 31st October 1918. C. 6. LORRAIN, Private, LOUIS, 3155740. 10th (Reserve) Bn. Canadian Infantry (Quebec Regt.). 31st October 1918. Age 33. Son of Martin Lorrain and Rozlin Sauve, his wife. C. 7. PAYER, Sapper, J. 3287810. Training Depot, Canadian Engineers. 30th October 1918. C. 8. McDONALD, Private, LAUCHLIN. 3181225. 17th (Reserve) Bn. Canadian Infantry (Nova Scotia Regt.). 30th October 1918, Age 23. Son of John A, and Mary A. McDonald, of Leitche's Creek, Cape Breton Co., Nova Scotia. C. 9. BRUNEAU, Private, J. 3211648. 21st (Reserve) Bn. Canadian Infantry (Alberta Regt.). 28th October 1918. C. 10. CHOUINARD, Private, V. 3171685. l0th (Reserve) Bn. Canadian Infantry (Quebec Regt.). 30th October 1918. C. 11. MURRAY, Private, A. 3039619. 10th (Reserve) Bn. Canadian Infantry (Quebec Regt.). 29th October 1918. Age 32. Son of Francois Murray and Louise Gagnon, his wife, of Masson, Province of Quebec. Born at St. Urbain de Charlevoix, P.Q. C. 12. BLAIS, Lance Corporal. EUSEBE, 145112. 22nd (Reserve) Bn. Canadian Infantry (Quebec Regt.). 27th October 1918. Age 24. Son of Odilon Blais and Theotise Blais, of St. Godfroy, Quebec. C. 13. KEATING, Private, R H, 3206922. 21st (Reserve) Bn. Canadian Infantry (Alberta Regt.). 24th October 1918. Age 31. Son of Patrick and Mary Keating. C. 14. CIMON, Private, JOSEPH ARTHUR. 3281011. 10th (Reserve) Bn. Canadian Infantry (Quebec Regt.). 22nd October 1918. Age 21. Son of Ulric Cimon and Rose Anna Fontaine, his wife. C. 15. THIBAULT, Private, A, 4040224. 5th Canadian Mounted Rifles (Quebec Regt.). 21st February 1919. C. 16. HURLEY, Private, J. 3030602. 8th (Reserve) Bn. Canadian Infantry (Central Ontario Regt.). 26th February 1919. C. 17. FONTAINE, Gunner, R. 2663214. Reserve Depot. Canadian Garrison Artillery. 22nd March 1919. C. 18. DANIEL, Chaplain to the Forces, The Rev IVOR, Canadian Chaplain Service. 26th April 1963. C. 19.